Upon knowing that among them was at least one kidnapper, the crewmembers were rather hostile towards each other as the day came to an end. Roxanne and Jess, the two Peophin sisters, were eating quietly together. The only member of the crew who didn’t really seem to care was the Techo, West. He just said “yarr” when spoken to. Maybe he was just too dumb to speak. Jack, who I assumed was feeling left out of the case, was glaring at everyone, gears churning in his head like he was trying to figure out who it was. I thought that was ironic because now all of the evidence pointed to him. He wasn’t automatically off the list just because his boat key disappeared; that could all have been an act to shift the blame. Jack’s grim expression showed that he was definitely in a sour mood this evening. Captain DeSoto wasn’t taking things lightly either. The Eyrie took large spoonfuls of the stew Wally had prepared without saying anything except, “West, take her out,” when he wanted the ship to sit at sea for the night. After dinner I rested at the stern, reflecting the day’s events and trying to link them all together. It was nice to do so under the black sky and stillness. We were definitely closing in on the kidnappers, and I was convinced that if we could get into Jack’s boat, that would be all the answers we’d need. Problem was, we didn’t know who had the key. We could always break in... that may be something we’ll have to do in the near future, I thought. She said goodnight and I watched her leave, her shadow-color blending with the real shadows on deck. I stayed on the stern for a while, listening to the gentle waves that rocked the ship back and forth. I think I may have fallen asleep under the stars just for an instant, because I jerked awake as an Eyrie Cab swooped overhead. A trip to Faerieland at this hour seemed absurd. I hoisted myself out of the chair and started towards the cabins below deck when a sound commenced from the bow, then twice more. A clunking sound was also coming from the spot. Thinking fast, I grabbed a gas lantern that was hanging from the wall and switched it off. Feeling my way across the deck, I took baby steps to avoid being heard as I crept towards the bow. A figure was stooped down near the railing, his or her arm jerking this way and that. I switched on the gas lantern really fast and the figure turned around, dropping the item. It skidded across the floor and hit me in the foot. I bent to pick it up, a whittling knife. Then my lantern and eyes moved upwards in the direction of who had the carving tool. “Your work of art?” I asked, gesturing towards the wood Damien found that had been hacked to pieces. “Uhh... I know she means a lot to him. I know that he wants to find her really bad. I thought that maybe if he thought she was here he wouldn’t be so upset with us.” I looked Wally in the eyes. He seemed honest, but I knew very well that looks could be deceiving. I thought about what he said. “Thanks.” We both passed the lookout tower where Simeon had probably fallen asleep again before sneaking back down below deck and into our rooms. The next morning dawned bright and early to the sound of Pirakets squawking and the fresh wind blowing in from our open window. I folded up my hammock and went straight to the galley for a quick breakfast and then over to port three we’d go. Luna was positive she could get inside The Unsinkable even without a key. She bragged that she was a genius at picking locks and we were about to find out if the Yurble’s skills were as accurate as she claimed. “I spoke with Wally last night,” I told the group, since we were the only ones eating breakfast, which was pancakes and syrup. I told them how he had been the one making Deaver teeth marks in the wood to make it seem as if Kip was here. Then I explained why Wally claimed he did it and this just got mixed reactions. “I think he was probably telling the truth. He seems very loyal to DeSoto,” Luna said. “Who does that leave not looking suspicious about something?” I asked. It was like everybody had some weird quirk or trait about him or her in this mystery. Luckily Luna was writing everything down accordingly to keep things straight. “Right,” said Charlie and I. “Very well,” I said, and then realized that we hadn’t given the Captain an oral report, as we usually did in other cases. “We’ve discovered the boat which was used to take Kip away from the ship on the 9th,” I explained. “Jack’s gone,” Captain DeSoto said simply. “And motive?” inquired Luna, looking even more disgusted. “I have a lot of enemies,” replied the Captain and he left it at that. Luna looked like she was going to explode. I put my paw on her shoulder to keep her from screaming. “Very well,” said DeSoto. “I look forward to speaking with you all again.” He turned and started into the galley. “I can’t believe he just fired Jack,” Damien said, stunned. Trying to decide on a snack? 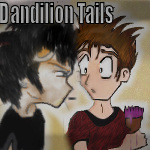 Dandilion Tails: Jump Jude Jump!